A week late, I know. And it’s a long post, so sorry! Trained for this marathon for 16+ weeks and this is my celebratory run. 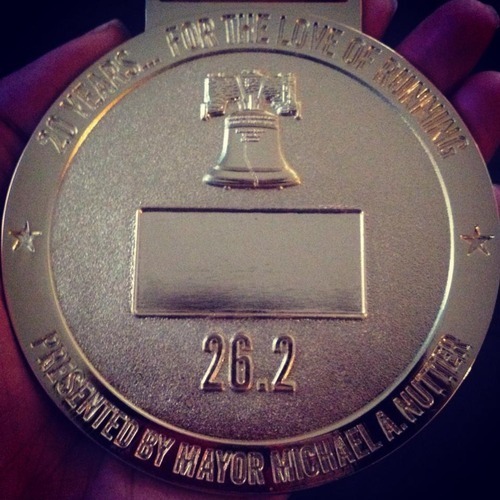 26.2 miles in my city, in my home, in my backyard. Had reservations for Maggiano’s on 12th and Filbert and carboed until I couldn’t eat anymore. They have the best bread and I seriously could have eaten like 5 loaves! That night, I was so anxious that I couldn’t sleep. Set every single alarm on: 3:00, 3:15, 3:30…but I was up by 11:00 PM after having gone to sleep less than three hours prior. 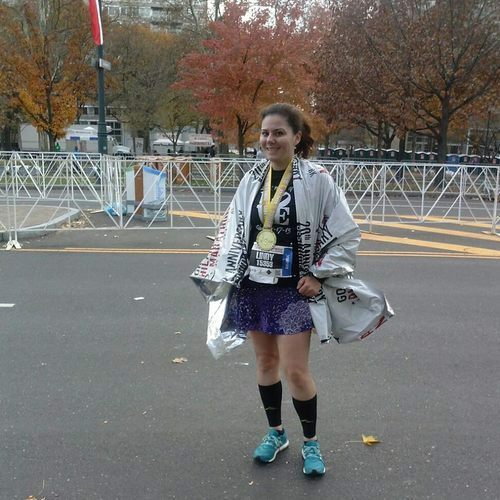 It wasn’t merely a standard pre-race anxiety, it was my first marathon and my mind wanted to race too. Drove to the train station where the airport line runs since the first train runs at 4 AM. Seems everyone else did the same too. Arrived at the Ben Franklin Parkway around 5:30 AM and good thing I brought my coat because it was really windy and cold at the start. Port-o-potty lines were long, and we waited in line approximately 45 minutes! Attempted to chow down on a toasted bagel with peanut butter and a banana but I was still feeling anxious. I did the best I could. Gun went off at 7:00 AM (first race that has ever started right on time!) and I crossed the start line at 7:32. With the Philadelphia Museum of Art behind us, we started to run down the Parkway, east on Arch through Chinatown, down towards Penn’s Landing to South Philly, back a bit north to running west through South Street where I saw some friends, through Chestnut Street and onto University City/West Philly towards the Drexel campus. That was Hill #1. I didn’t train on hills (huge mistake) but I ran it up until we reached 30th Street Station. The views were spectacular! While I ran with my iPhone, I tried not to take pics, after all, I live here anyway. At times I forgot where I was…I kept worrying about keeping pace, hindering my ability to fully enjoy the experience. Looking at my watch, the numbers written on my arm, keeping close eye on the Clif pacer, and so on…that made me so sad. Ran past the oldest zoo in America, the Philadelphia Zoo and back towards (MLK Drive) West River Drive and towards Eakins Oval, where the half marathoners would steer right to the finish line and marathon runners would run left for another 13.1 miles. At the half mark I saw my sister, she hugged me and handed me some pretzels and I was on my way. I was already 30 minutes past half marathon goal but I wasn’t worried. I ran my first half conservatively, saving all my energy for the latter half. 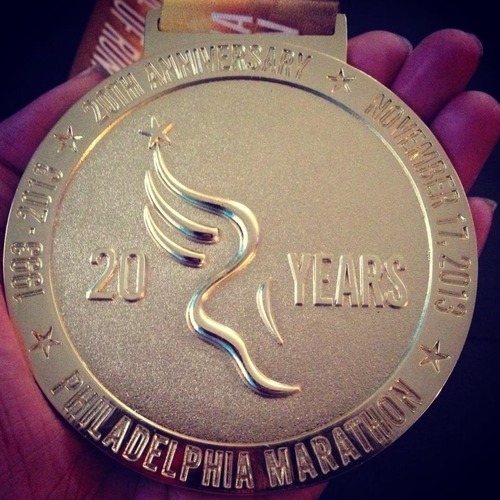 The next miles would have you running on Kelly Drive, with the Schuylkill River on your left and the torture of watching the runners in their last trek on the right. It’s an out-and-back course and that’s what I dislike about it, honestly. You’re on mile 17 and they’re on 24 running right beside you, just going opposite directions. That was quite a mental battle for me. Mile 18 was rather strange…right before the 30K mark, you veer off to your left to run through the Falls Bridge (which is gorgeous, btw!) then make a u-turn and run right back. Saw my co-worker who’s a badass runner, she’s an elite runner, who was out cheering with her infant son. She gave me some words of wisdom and it was very nice to see someone during the latter half of the course. Got my second wind and off towards Manayunk. Dear Manayunk, I spent most of my twenties partying on Main Street and I never realized how hilly those roads are. We didn’t run through the actual hills of Manayunk, oh dear God, no. But anyway, Main Street is far from flat. Run down Main until the bridge (where it ends and there’s a road that puts you on I-76) and that’s mile 20. Make another U-turn and back towards Center City. Mile 21 and we’re in front of the movie theater right by Ridge Avenue and I’m starting to cramp up, badly. I’d already lost sight of the pacers…they were a mile ahead! Grabbed some water at 21.5, ran/walked a bit more and by mile 22, I was walking. Stopped on the side of the road and stretched but the ball of my right foot felt like it was on fire and my left ankle was hurting. I was getting so many text messages from my running friends encouraging me to keep going. I limped my way to the finish line. Saw my sister at the 25.5 mile and she got on the course and walked with me until mile 26. The Philadelphia Police Officers were cheering on, encouraging me to sprint the last 0.2 to the finish line. Funny thing is that you literally can not see the finish line until you’re at 26.1 and I forgot about the pain and ran until the end, high-fiving Mayor Michael Nutter, crossing so far off my goal time. And I started to cry when I got my space blanket and my medal. I was relieved, delighted but I was angry. I didn’t feel accomplished. So many people had left and I felt like the last person there. I had support from everyone, except my Mom, and it took her a week exactly to explain her behavior. She never, not once, asked me how I felt, if I needed anything, nothing. She wanted no part in this. She even went out of town to Virginia for the weekend so she’d have an excuse not to go. Anyway, last night she said to me that I should reconsider running marathons. Angry with me that I have all these races scheduled for next year. Her response, “I’m afraid something is going to happen to you.” While I can understand as a parent, I simply told her to just support me. You may not understand why I run, just be there as a parent, when I need you. I ended up going to the sports doctor and getting my left foot examined. Thankfully, it isn’t a stress fracture but possibly peroneal tendonitis. Only cardio allowed is swimming for at least 2-3 weeks. Can’t wait to get back into running. I’ve got a half in 8 weeks!